Pakistan Telecommunication Company Limited, PTCL re-launches postpaid and prepaid packages for its 3G EVO, Wingle and Nitro Cloud customers. PTCL has reduced the monthly data limit from 75-GB per month to 50-GB per month for Wingle Unlimited Package and also increased its price from 2,500 per month to 3,200 per month. PTCL has reduced the monthly data limit and also increase the package prices for all packages. To better serve customers, all new and old EVO connections will carry a fair usage policy of 30GB and 20GB. The new packages are applicable on both Rev.A and Rev.B EVO devices including EVO Wingle, EVO 9.3, EVO 3.1, EVO Tab and EVO cloud devices and will be implemented from June 1, 2014. Extra usage will be charged at Rs. 150 per GB for both EVO Postpaid and Prepaid customers. Speed throttling will no longer apply on post-paid packages. PTCL now offer these packages to its EVO, Wingle and Nitro customers. Click to Compare Packages. New Offerings of EVO 3G will go into effect from the 18th of June, 2014. 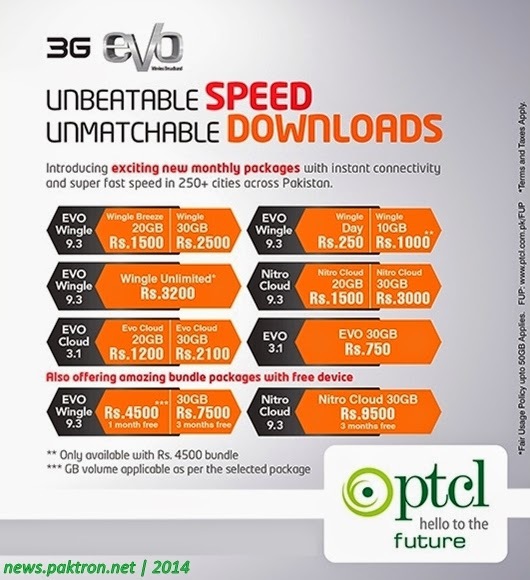 New Offerings of PTCL EVO 4G will go into effect from the 28th of July, 2014.